This is a simple little recycling craft for children old enough for cut and paste crafts. 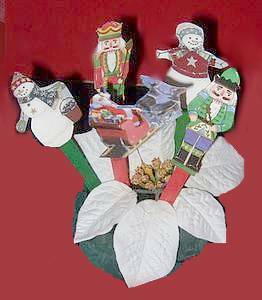 It shows how to make miniature stick puppets from old Christmas cards and popsicle or craft sticks. Give the kids a supply of old Christmas cards and let them cut out the shapes of different Christmas characters. Take the opportunity to discuss with the children the symbols of Christmas and their meanings. Supply the kids with popsicle sticks or craft sticks; one stick for each puppet. Craft sticks sometimes come in prepainted colors such as green or red; if yours are plain, you could leave them as is, or paint them with craft paint. Simply glue a cut-out character at the top of each stick. Display them together in a vase filled with rice, beans, sand, sea glass or marbles and topped with a single silk poinsettia bloom. The children can play with the puppets, then replace them in the vase when they are finished.